A = Model. B = Estimated number manufactured. C = Total number recorded by the Club. D = Total number that survive. D1 = Number surviving that are roadworthy. E = Number that survive with their original style bodywork. E1 = Number that survive with their original style and are roadworthy. F = Number converted to ‘Specials’. F1 = Number converted to ‘Specials’ and are roadworthy. G = Number surviving as chassis only. H = Number in unknown condition (due to lack of information or not heard of for many years). The number of Triumphs recorded has been increased many-fold in the past few years by Club Members visiting their local authority’s record offices and searching through their vehicle registration records. 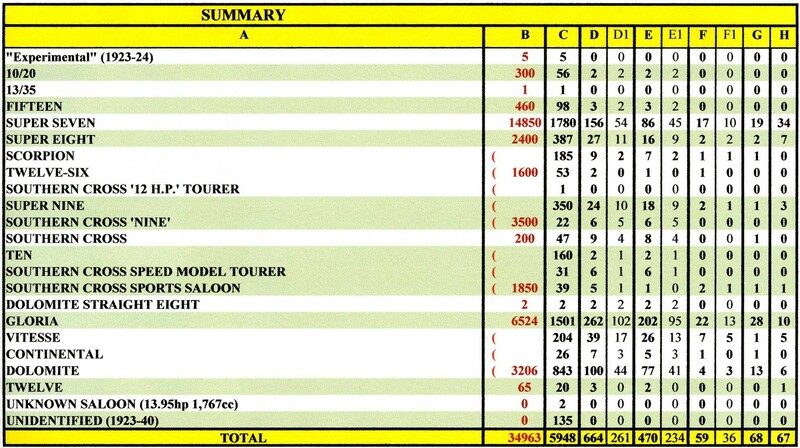 This is a straight forward process and the results are highly valued by the Club for giving a better picture of the numbers produced for each model. Another great benefit in increasing the Triumphs recorded is that we have a good chance of answering questions on specific cars. If you wish to visit your local authority record office to record more Triumphs, please contact me and I will let you know what is involved. The local authority records checked by Club Members include: Buckinghamshire, Coventry, Doncaster, Essex, Herefordshire (part), Huntingdon, Leicestershire & Rutland, Lincolnshire, Norfolk, Northampton, Sheffield, Suffolk East & West.